Trying to distance herself from the life of Kings of Chaos hasn’t been as easy as Bluebell Strong thought it would be. With a seemingly perfect man, Blue still can’t see herself continuing the relationship with Jamie Rolf Stevenson. Blue is always the good girl, and being the saint to all once again steps up to take care of her nephew, but will her sister Calla reveal secrets that could damage the family as they know it? An enjoyable read with a unique plot that, for the most part, kept my interest. There were a few areas that fell below the line of entertaining. Perhaps those scenes could have been omitted or in some way added to the storyline to make it more interesting versus making the story drag. This may sound weird but I enjoyed the author’s writing style more in the first part of the book better than I did the latter part. What I mean by that is the first part of the book revealed Blue, her thoughts and her feelings. The author wrote lines that had a poetic flow but as the novel went on it lost that style. It’s possible Blue started out as a strong woman willing to take a stand for what she wanted, going against her family and ending a relationship that she knew wasn’t for her. I liked that Blue. 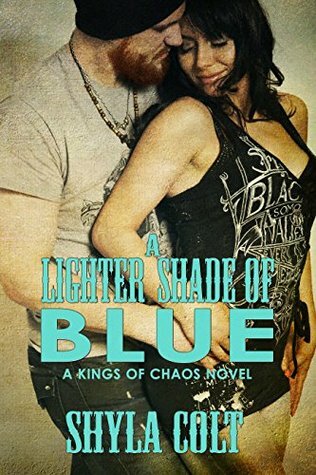 I didn’t like the lighter shade of Blue, the one that was submissive to the alpha male. All the ‘you are mine’ and ‘who do you belong to’ just wasn’t that appealing to me. Blue was a woman that had be through enough why did she have to be broken down to being someone’s property? And being property to a man that she desired? Is this the behavior of the motorcycle clicke, well perhaps so. Why couldn’t Blue and Shadow be a power couple where Shadow is the man without all that extra “I am alpha” male? Calla is the big sister no one wants to have. I mean really how disruptive and disrespectful can one sister be? These two are totally opposites. Blue is loving and motherly and Calla is all about herself and making everyone else’s life hell. But without Calla this story wouldn’t have all the juice and drama because it seems Calla laid the bricks to put some of the drama in motion. Mr. Perfect Boyfriend Jamie also did his share to add to the drama. So hands down this author knows how to create the unlikable character and bring a few servings of drama to make a novel that is sure to satisfy it’s readers. Who can turn down a sister revealing a few family secrets and a man with a vendetta? Let’s not forget the sizzling attractions between Blue and Shadow. Though I felt their relationship lacked development, and that they just jumped right into the physical, their physical action is sure to give readers a steamy pleasing rating on the sensual scale. For a reader who may not prefer to read profanity, this would not be a book that I would recommend. There is also an over usage of the word “God” during character conversation. This book series has potential and I would like to see how the family of bikers react to the ending devastating consequences so I would give this author another try. Though it’s not high on my ‘you must read’ list I would still recommend this to those that enjoy a hot sensual read with plenty of drama.